7903 runs round its train at Cheltenham Race Course station. 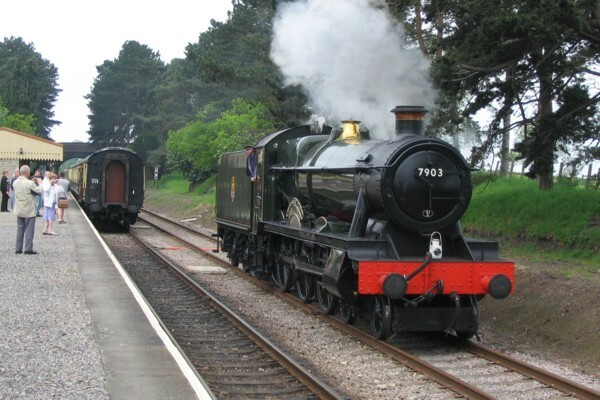 Far too long ago, I sat on the driver’s seat of Burton Agnes Hall in the dock siding at Totnes. 6998 was there with 1363 and they later worked up from the south west under their own steam to become some of the earliest arrivals at Didcot. I sat there and imagined how it must be, the speed, the noise, the excitement, the feeling of being really alive. I never dreamt I would have the privilege to stand on the footplate of a Modified Hall as a trainee fireman and really get to know what these engines are like for real. I guess at the time it all seemed unlikely that it would happen to a teenager destined for a white collar life. I may be far too much older now but over the past 4-5 years, I have really enjoyed working with crews on Foremarke on the Glos Warks as a volunteer. It has been a big challenge for me in my latter years: I spent my work years in education with almost no knowledge of engineering or the reality of looking after a steam engine. I have been, as they say in education, a ‘slow learner’, feeling slow and too stupid too often as the guys who know this engine inside out keep her in tip-top condition wrestle with the day to day work of routine maintenance. 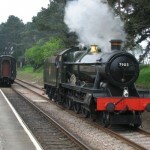 There are compensations: 7820 Dinmore Manor will arrive almost as Foremarke departs, which is an exciting prospect. 4270 was having its side tanks craned into place yesterday and she will be available next year too. 35006 is not far behind, as is the NRM’s 4F No 44027 and there are also two long term projects soon to start. It’s a good time to be in the GWR’s Steam Department at Toddington. And, for the GWR in general, the potential is huge: a mainline connection at both ends and the capacity to replicate what the GCR have done at Loughborough with higher speeds and double track. Will I live long enough to travel on Foremarke at 50 mph? I doubt it but being part of the effort to achieve it all is a huge privilege and one for which that teenager inside me is very grateful indeed.